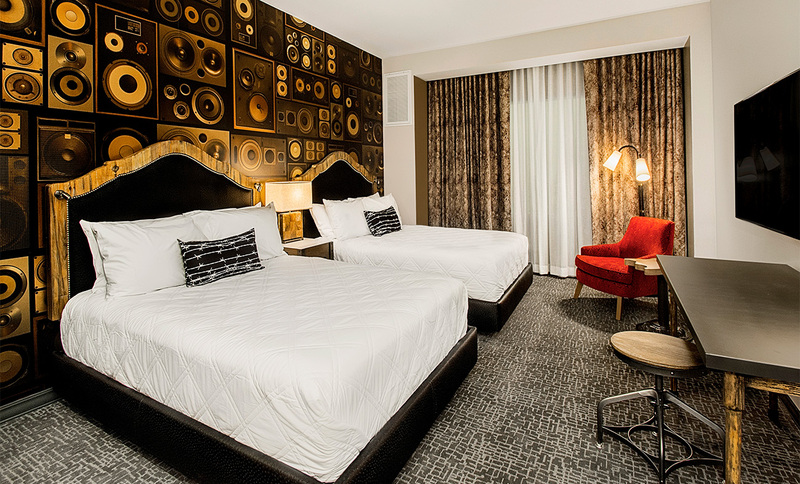 The Cambria Hotel, Nashville was designed to embrace the Sobro (South of Broadway) neighborhood where it is located. 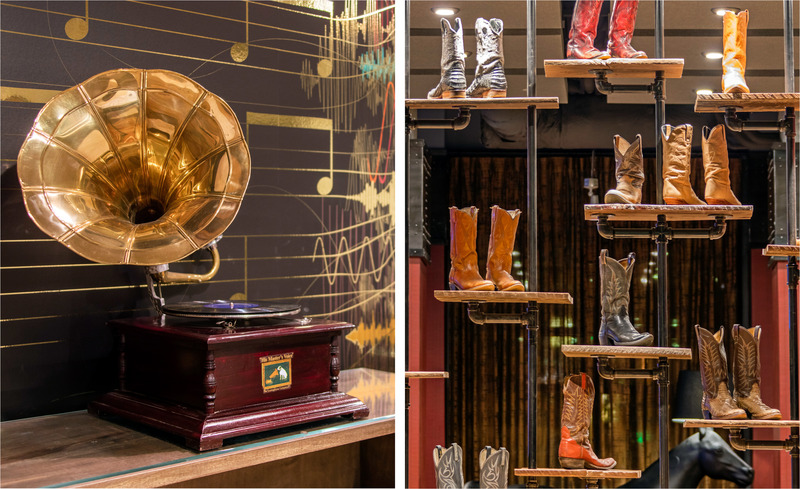 Within walking distance of the honky tonks of Broadway and the Music City Center, there was natural inspiration drawn from the local music scene. 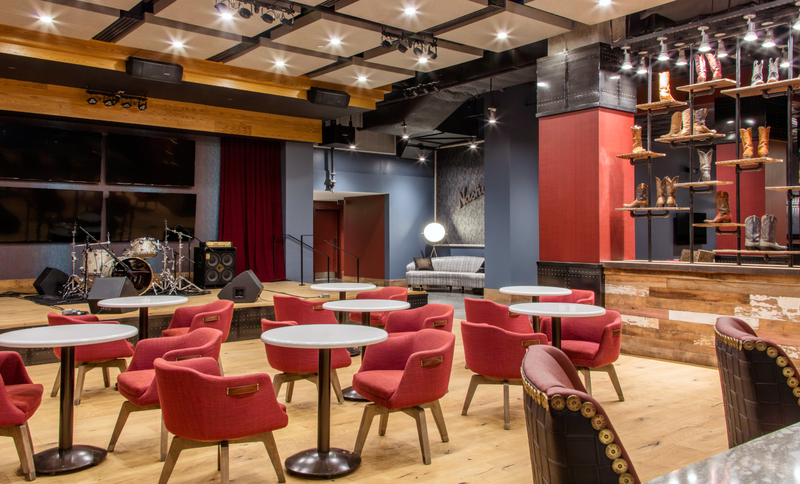 The main lobby floor includes a bar with a stage to highlight performers, while there are myriad design elements nodding to the musical vibe of the surrounding area. 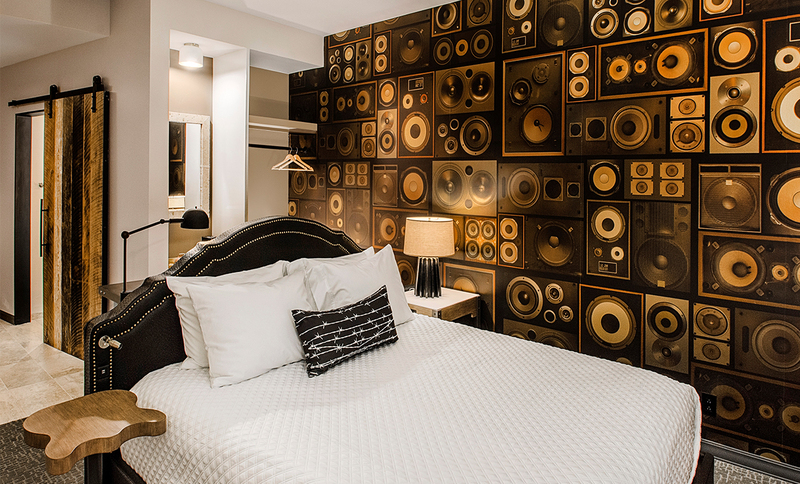 These include a display of old phonographs, sheet music wallcovering, an installation of repurposed car speakers and a light fixture evoking the visual concept of sound waves. 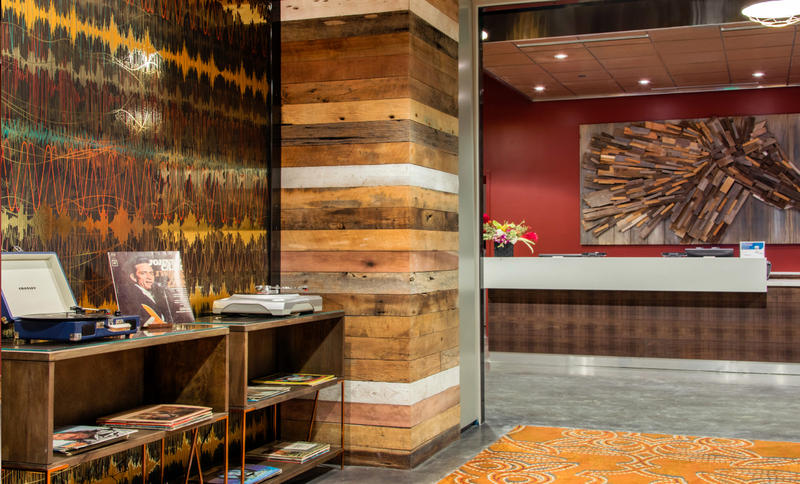 To further embrace the local culture, there is an installation of Hatch Show Print posters in the restaurant area and the use of locally reclaimed hardwood throughout. 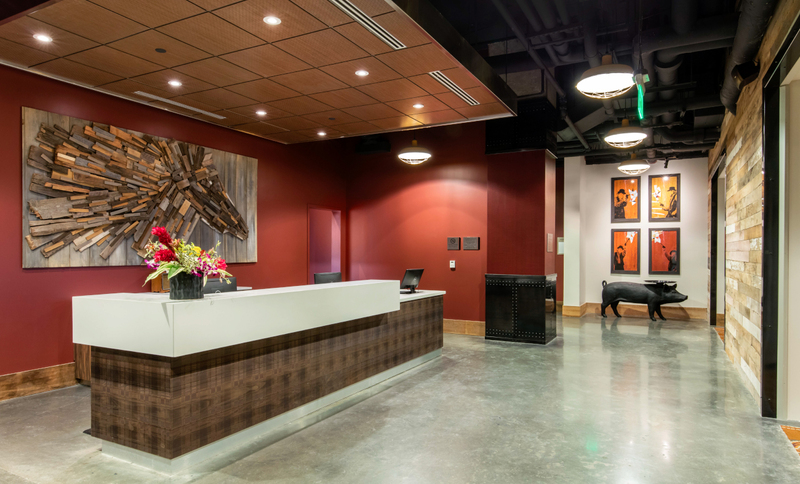 The interior spaces are appointed with materials that evoke the country western culture of this region by use of rustic materials, including concrete floors, leather-look columns, wrought iron cladding, boot stitch inspired carpet and an installation of old cowboy boots as a divider wall. There is a rustic sensibility that marries perfectly with this neighborhood, while remembering not to take itself too seriously. There are fun accents including a pig table, a horse lamp and funky art to remind the guest that this is a place to enjoy! 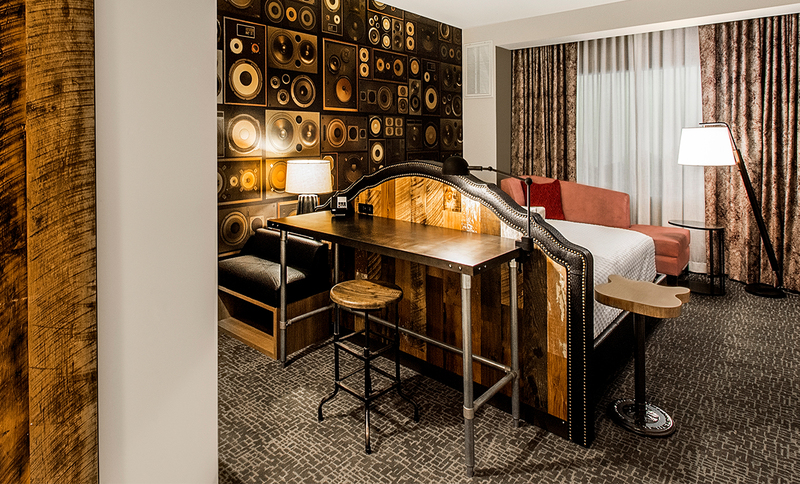 The guestrooms are similarly styled and feature a speaker collage on the walls, a guitar shaped side table and iron and wood furniture, creating a warm respite from the nightlife below. 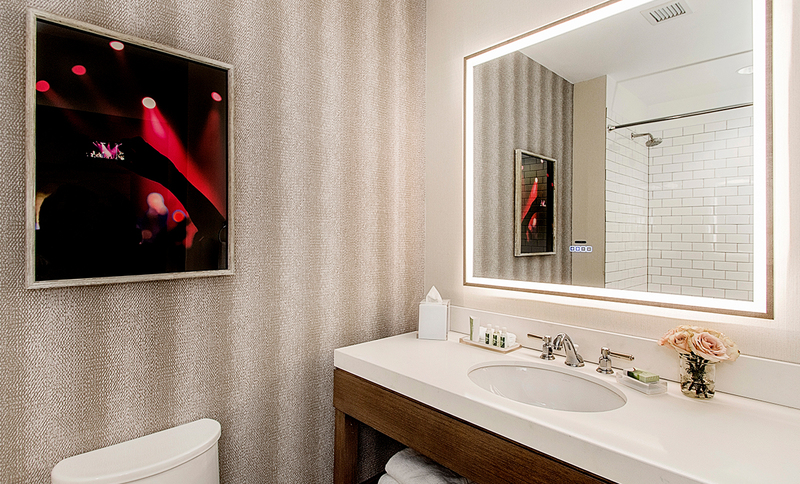 There is even a bluetooth speaker built in to the bathroom mirror…to keep the music playing.